In the small town of Troy, Tennessee, population less than three hundred, it’s hard for Helen Ramsey to keep her business to herself, and even harder to live with the wild blood of scandalous ancestors running through her, “I often traced the veins on the back of my hands and wondered where those fiery and untamed rivers would lead me.” (pg. 2) Despite her troublesome heritage, Helen Ramsey stayed in Troy to marry Rudy, passing up the chance to open her own beauty salon to work in his hardware store. At 38 she feels unappreciated by him and though her temper leads to loud, public arguments that air their troubles in front of half the town, Rudy doesn’t seem interested in changing. The arrival of Garland Cookson, who returns to Troy to take over his ailing father’s grocery store, further ignites Helen’s rebellious nature. She remembers Garland at eighteen as a heroic figure in her twelve-year-old eyes, and when they meet again as adults, the attraction between them is undeniable. Helen takes the flirtation a bit too far, to spite Rudy and Garland’s uptight sister Cassandra, the town busybody. Rudy’s jealousy of Garland leads to a tragedy involving Helen’s best friend, leaving the best friend’s daughter Tansy orphaned just as Helen was many years before. Helen’s request that they adopt Tansy, one of the few things in her life that she has asked of Rudy, causes an explosive argument between the two of them when he resists. Garland rescues Helen from the altercation and takes her to stay at his grocery store, leading to accusations from Rudy that his wife is being held hostage. 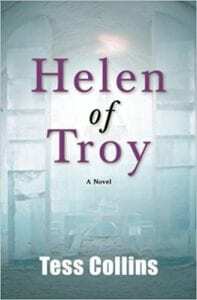 As the entire town takes sides in the argument, the standoff escalates into a full-out war in the town of Troy between those who want to maintain the status quo and those who defend Helen’s right to choose for herself. With all eyes in the town upon her, Helen struggles to decide between the man who’s been with her all her life and the sensitive hero who has rescued her from the mundane. As Rudy builds a Trojan Horse that contains a trap for her heart, and secrets about Garland’s past add to her confusion, her choice becomes harder still. Ranking near to The Story of Edgar Sawtell in great rewritings of classic stories, Helen of Troy demonstrates that love and battle can be as epic in a tiny, isolated town as they are in the legends of ancient Greece. Collins brings the quirks of the small Appalachian town to life through realistic characters and well-chosen scenes that depict both the ordinary and the outrageous. Beautiful yet understated descriptions evoke some lovely images that contrast strikingly with the details of day-to-day life that make the story real and accessible. Garland and Rudy are both written so well, with their respective strengths and weaknesses, that it’s hard to decide who to root for, and Helen’s spirit and warmth make it clear that it’s not just her lovely face that drive men to fight for her. Quill Says: Helen of Troy splashes rural Appalachian color over the ancient scrolls of legend in a charming and timeless story. Article first published as Book Review: Helen of Troy by David Wroblewski on Blogcritics!